Do you feel that the time has come to buy your first SLR camera? If for whatever reason, you are ready to make the leap to your first digital SLR I will recommend some cameras that could be ideal for you. When you are already determined to buy it, you are flooded with doubts about which camera to choose among all the ones in the market . The first thing you will find in the world of reflex photography is a battle for the supremacy of two powerful brands : Canon and Nikon . This is a long battle that will hardly have a clear winner. Something shared by Canon and Nikon (Nikon and Canon) is that being the two best-selling brands, it is also about the brands for which there is a greater number of options (and, sometimes, more competitive prices) in terms of objectives and other compatible accessories . What does this mean? The purchase of a reflex camera is usually the first of the steps to a series of purchases of photographic equipment. As you begin to progress in photography, you will gradually experience the limitations of not having a more luminous lens, or with an external flash , or you may want to experience what it is to shoot photos with a fixed focus. Surely, you will go shopping for accessories and accessories that should be compatible with your camera. Well, the lenses and other accessories are not compatible between different brands of cameras. So, when you decide that your first SLR is “small” and you want to buy a new SLR, it is very likely that you will find yourself with a series of objectives in which you have spent good money and will only be compatible within the same brand. The cost of the brand will be high: it is something that you should keep in mind when buying. Maybe something like this has happened to you in the head: ‘ Well for 500 euros more I buy it more professional and I already have it ‘. Well, it’s always an option. But you must take into account one thing, professional cameras have been designed for professionals. They have better features and quality, but do not have certain facilities and automatisms that are useful when you are learning. They tend to be more bulky too (they are more lazy to put them on their backs) and do not usually have accessoriesand objectives of the economic range (let’s say that the experience is much more expensive). If you have starting information to know what can be some key features that a semi-pro or professional camera should have to fully adapt to your tastes. So, that, I would almost recommend that you start this path with an introductory SLR . A very good option to make the leap to the world of SLR. It is a light camera, small and simple to operate , that with a 24.2 megapixel sensor will allow us to obtain very good quality photographs, as well as record videos in Full HD. It has a system of focus of 11 points cross in the central part, has creative effects to apply to our images and a high quality viewer. In addition, for those who record video with it, their continuous focus system will be very useful. It is therefore one of the best and most valued reflex for users who start with this type of camera, and also has a very economical price. The differences with its previous model, the Nikon D3400 are mostly aesthetic and connectivity. The external part of the camera has been completely redesigned, grouping all the buttons to the right. This has reduced its weight and size . In addition, it has also incorporated a Bluetooth of low consumption , to extend the life of the battery when we use the connectivity with Snapbridge. If you know that photography is your thing, and you want to start with an SLR camera with which you will be happy for a long time due to all its possibilities, this may be your camera. It has a CMOS APS-C sensor of 24.2 megapixels, a folding screen to create frames from the most creative perspectives, and has a focusing system of no less than 39 points so that the protagonists of your photos are always focused. 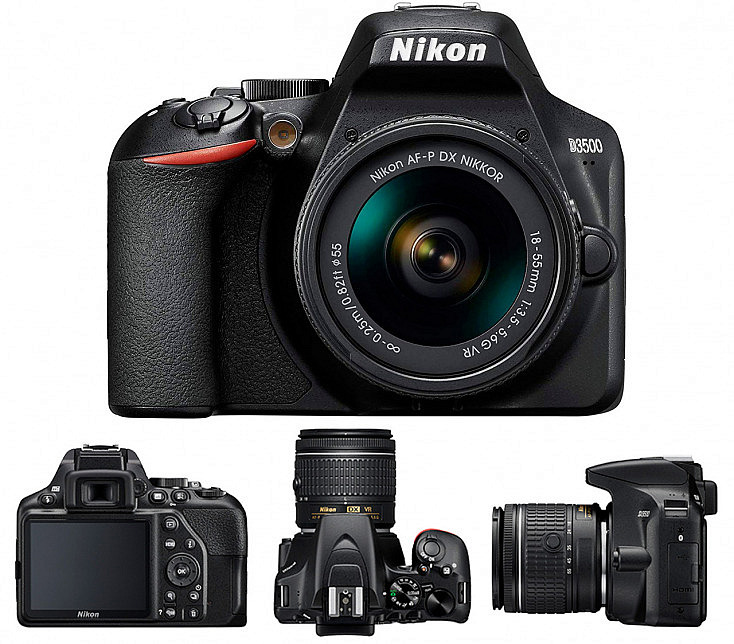 This model, very similar to the Nikon D5500, weighs less than the D5300. Other improvements that incorporate compared to previous models is a higher maximum ISO sessability of up to 25600 (compared to the 12800 of the D5300) and the screen itself is tactile. It also has a long battery life, which is a point to consider. In short, a great camera to make the leap to the SLR and deepen all the options they offer us. If you are looking for your first SLR and your budget is tight, the Canon EOS 4000D may be a good choice. Lightweight, simple to operate and with a market price that few can improve . It is a very comfortable camera to travel because it occupies little space, but we are talking about a reflex camera that will allow us to have higher quality photos than a compact one. It has APS-C sensor of 24.1 megapixels, has a good performance and is capable of recording video at a resolution of 1080p (high definition). In addition, it has several creative filters to seduce the user, and is compatible with a wide range of objectives that, if you really like photography, you will want to add to your team over time. Obviously it is not the best Canon you will find in the market, but its price is really attractive. The Canon EOS 2000D offers us more features than its small sister the 4000D. It has a larger screen (3 “compared to 2.7” of the 4000D) and higher resolution (920,000 pixels compared to 230,000 of the 4000D), with which you can view your photos with 100% coverage and a high quality. It has APS-C sensor of 24.1 megapixels, has a good performance and is capable of recording video at a resolution of 1080p (high definition). In addition, it incorporates Creative Auto Mode (CA) that helps new users to obtain good results without having knowledge about exposure or other more advanced controls. Although Sony is a well-known brand, in the world of SLR photography it does not have the reach that other brands like Nikon or Canon can have, and not because they do not make quality products. Do not be fooled by the volume of the Sony A68, although it is quite light . It represents many improvements with respect to the previous model, the Sony A58, since it now has a CMOS sensor of 24 megapixels and an ISO sensitivity range that reaches up to 25,600 (the A58 reached only up to 16,000). What stands out most about this model is the automatic focusing system with phase detection of 79 points, with 15 grid points. It continues to include the translucent mirror technology, being able to shoot in burst mode up to 8 photographs per second. A camera at a good price , recommended for people who like to photograph all the details of a trip without carrying a heavy equipment, or those who need to accurately capture fleeting moments such as a sporting event. If you are looking for a good and resistant camera , to accompany you on trips and excursions in which the weather conditions can vary a lot, this can be your camera. It is the smallest SLR model in its class, built to be dustproof and weather resistant. It has a sensor of 20.12 megapixels, which combined with its processor PRIME M II, offers incredible results. It still maintains a great ISO sensitivity that can reach up to 51,200. It records video in Full HD and now includes, as a novelty, the recording of sound in stereo . It has an 11-point focusing system (9 of them crossed ), a tiltable and adjustable screen with very good definition and stabilization system in the body. One of the most remarkable aspects of this model is its connectivity since it has Wi-Fi and NFC. With the smartphone app, you can shoot remotely, transfer, view and share social networks instantly. Undoubtedly, the perfect equipment for those who are afraid to take the camera in case something happens to him, since his sealed body is made so that climate changes do not worry when shooting the photo. I would like to learn photography … Where do I start?